* I have just discovered that experienced attacker Denis Nchia Kang (born 30.06.1986) is playing for Aigle Royal. Nchia Kang had several good seasons for Fovu Club before he joined Ittihad Khemisset (Morocco) in 2009-2010. * Christian Heumi Kabon (born 01.01.1989) of Astres de Douala is a player that deserves attention. Heumi Kabon is the playmaker of the team, known for intelligence, skills and for being a set-piece expert. The picture is of Heumi Kabon and was found on 45fois2.com. * Nicolas Brice Moumi Ngamaleu of Canon Yaoundé is a player to watch. The teenager, formerly of Cameroon U-17, was signed from Musango FC de Yaoundé and has trained with Cameroon U-20 during the season. * Alexis Kada Yougouda (born 29.11.1994) of Cotonsport FC is arguably one of the most exciting midfielders in Cameroon. During the season, Yougouda has forced his way into the first team of Cotonsport FC and played for the Cameroon U-20 national football team. * Bouba Aminou of Cotonsport FC is currently in great form and having a great run in the team. Aminou played for neighbors Scorpion FC last season, apparently on loan from the “big brother” in Garoua. Burly striker Jacques Haman (born 30.08.1994) is also doing well, having scored at least seven goals so far this season, most likely one or two goals more. A couple of days ago, Haman was yet again picked for Cameroon U-20. * The lively attacker Ngampiep Vigny Kologni (born 27.11.1983) of Panthère Sportive has scored at least six league goals this season, most likely one or two more. * Jean Landry Bassilekin is having a fairytale season. The lanky striker scored eight goals for Renaissance FC before signing a professional contract with AS Nancy (France). According to the official homepage of AS Nancy, Bassilekin is born 23.01.1993, is 188 centimeters and 73 kilos. 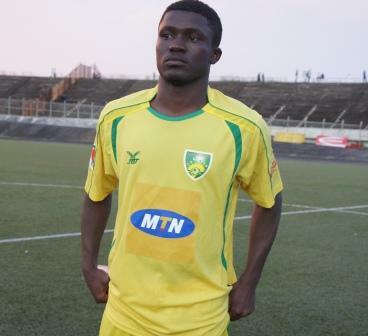 Bassilekin has also forced his way into the squad of the Cameroon U-20 national football team during the season. * Attacking midfielder Ludovic Ndzie of Renaissance FC has been one of the revelations of the season. I’m currently trying to find more information about Ndzie, who came from pretty much nowhere and forced his way into the squad of the Cameroon B national football team after just a couple of top level matches. * Scorpion FC de Mbe is having a terrible season and has already been relegated. However; there are some bright spots. Yaya Zoua Dambe is an interesting centre-forward. Dambe, formerly of Cotonsport FC, is apparently the younger brother of enterprising striker Jacques Zoua of FC Basel in Switzerland. Dambe was part of the Cameroon U-17 national football team in 2010 and is most likely born in 1994 or 1995. * Veteran Joël Moise Babanda (born 12.01.1980) of Union Douala is my bet for “Meilleur joueur” of the MTN Elite One 2012. The playmaker has scored at least 14 goals during the season. Babanda’s understanding with energetic striker Charles Edoa Nga (born 17.05.1990), who has scored at least nine goals during the season, is arguably the main reason behind the current success of Union Douala. * Vincent Mbarga Manga is an interesting attacker at Union Douala, often found on the wings. Mbarga Manga, formerly of Renaissance FC, has played regularly throughout the season and scored at least three goals. Mbarga Manga is most likely born in 1990 or 1991. * Ikechukwu Agada Emedolibe (born 22.06.1990) is a Nigerian striker who played for US Gorée (Senegal) during the Ligue 1 2010. Emedolibe, a former trialist at KSC Lokeren (Belgium), joined Union Douala during the mid-season transfer window and has scored one goal, mostly being used as a substitute. * I have just discovered that Unisport FC has signed experienced attacker David Ambeno Ake (born 26.05.1985) from Tiko United FC. Ake has been with Tiko United FC since 2006. According to sources I find trustworthy, pacy attacker Eloundou is born 04.12.1994. On 22.09.2012, Eloundou scored a goal when Cameroon U-20 defeated DR Congo U-20 in a qualifier for the 2013 African Youth Championship. Eloundou has scored three goals during his last three matches for Cameroon U-20. * The Young Sports Academy, mostly referred to as YOSA, has an interesting goalkeeper in Hosea Abongu Nkesi (born 01.11.1990). Nkesi, formerly of Matelots de Douala, is apparently 191 centimeters and 84 kilos. In August 2012, Nkesi was part of the Cameroon B national football team during the 2012 Nehru Cup, a football tournament in New Dehli, India.